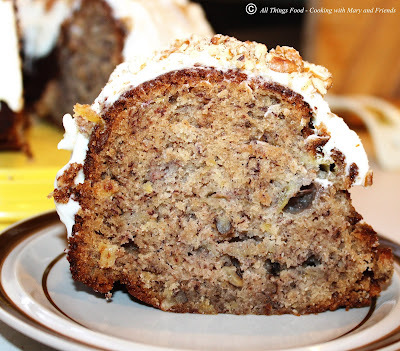 Hummingbird cake is a banana-pineapple spice cake common in the Southern United States. Ingredients include flour, sugar, salt, ripe banana, pineapple, cinnamon, pecans, vanilla extract, eggs, and leavening agent. It is often served with cream cheese frosting. 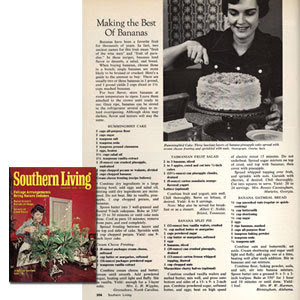 The cake has been a tradition in Southern cuisine since the mid-20th century.The first known publication of the recipe, as written by Mrs. L.H. Wiggins, was in the February 1978 issue of Southern Living. The cake won the Favorite Cake Award later that same year at the Kentucky State Fair. 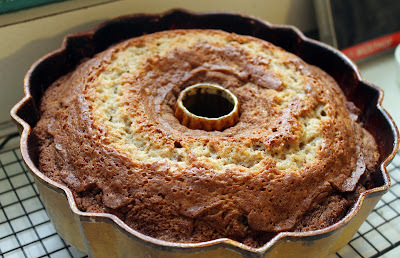 Although normally made as a layer cake, it is delicious as a bundt cake, which is the way I decided to bake it. Oh my goodness ... moist, tender, delicate and delicious! No wonder this cake won a "favorite cake" award at the Kentucky State Fair. Preheat oven to 350°. Whisk together flour and next 4 ingredients in a large bowl; add eggs and oil, stirring just until dry ingredients are moistened. Stir in vanilla, pineapple, bananas, and 1 cup chopped toasted pecans. Spoon batter into 3 well-greased (with shortening or sprayed with baking spray) and floured 9-inch round cake pans, or one Bundt pan. 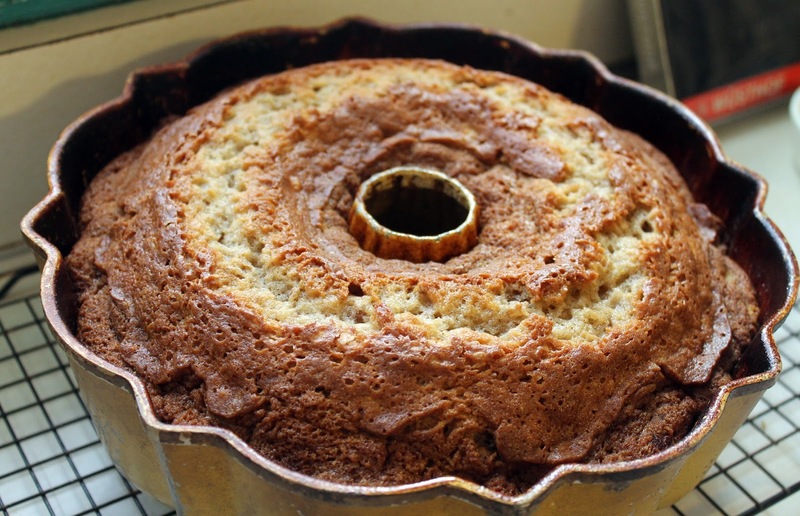 Bake at 350° for 25-30 minutes (layers) and 60 minutes (Bundt pan) or until a wooden pick inserted in center comes our clean. Cool cake layers in pans on wire racks 10 minutes; remove from pans to wire racks, and cool completely (about 1 hour). Frost with Cream Cheese Frosting and top with more chopped pecans. Beat butter and cream cheese together in a large mixing bowl until creamy. Add confectioner's sugar, vanilla and milk and beat until smooth. 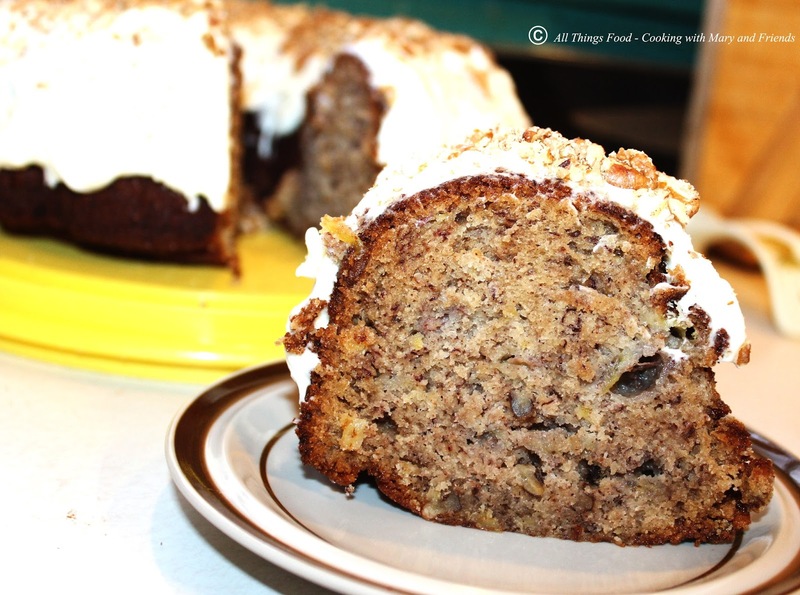 Frost cake and top with chopped pecans (optional).